16 oz. 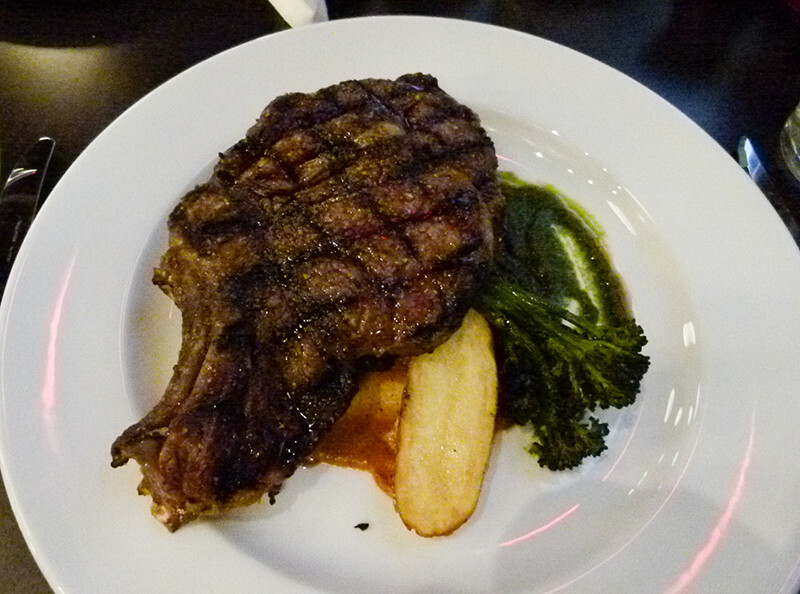 bone-in rib-eye steak. A friend had recently mentioned that a new cafe/bar/market had opened in Mt. Lebanon and that it was owned by Brooks Broadhurst of Eat’n Park family fame. Intrigued, I went there to see what the new place was all about. Block 292 is on the site of a former gas service station on Beverly Road. I pulled into one of several parking spots that they have in front of the restaurant and entered the building. The market was to my right and the cafe and bar to my left. The market features various custom cuts of beef, chicken, and pork, including steaks, chops, ground beef (made from beef trimmings and some chuck), sausage, bacon, lamb, and even rotisserie chicken. Also available is a selection of dairy, eggs, produce, and canned goods. Broadhurst, a Mt. Lebanon resident who still works in supply and sustainability at Eat’n Park, proudly said, “In the market, you can get what you need to make a meal. We even have soup bones.” It was nice to see many local brands on the shelves, including Chef Bob Sendall’s Toffee Taboo, Enrico Biscotti, Millie’s Ice Cream, and Betsy’s Ice Cream. 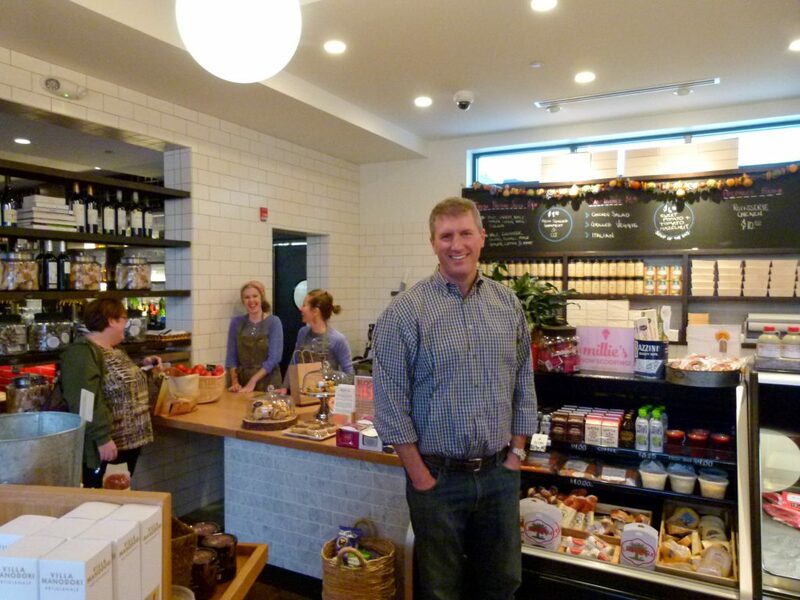 Brooks Broadhurst proudly smiles in Block 292’s market section as shopkeepers wait on a customer. 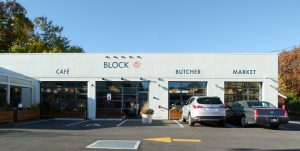 The “block” in Block 292 refers to their in-house butchering program. The 292 is the numerical part of their address. The market and restaurant feature locally raised, high-quality beef, pork, and chicken butchered on the premises into different cuts of meat. Max McCarty is their head butcher and utilizes whole animal butchery. The meat is the freshest possible, and there is little to no waste. Chef Christian Schulz, formerly of Root 174 in Regent Square, leads the kitchen staff. Broadhurst said their menu features seasonal American fare and changes occasionally. There are also daily specials and cuts of the day. The cafe seats about 75 and the bar approximately 18. The decor is simple, somewhat contemporary, yet warm. Banquette seating runs across the left wall. The same style cushions are featured in the booths. It’s also a little bit of a happening place with a nice bar and classic rock tracks playing softly in the background. I invited my associates C. and M. to lunch. We kicked off our festivities with appetizers of wings, Block Charcuterie, and potato soup. Soon the wings and charcuterie plate arrived. The plate was served with small, thin slices of baguettes, sliced onions, and pickled cauliflower florets. C. and M. quickly dived right into the slices of salami and cheese. They were loving every minute of it. The deep, rich flavors of the meats (from Parma Sausage) and imported cheeses satisfied our midday hunger pangs. Although, about halfway through the charcuterie plate, I noticed that the housemade pate’ was not included in the assortment as the menu stated. We flagged down our server, and the pate’ was promptly brought. I’m glad I noticed the omission as the pate’ was very good. Not a soft pate’, it was served as small formed slices. Each slice speckled with a few chopped pistachios and a piece of fig in the center. It was a delight to the eyes and palate. Wings with a dry spice rub and smoked apple BBQ sauce. 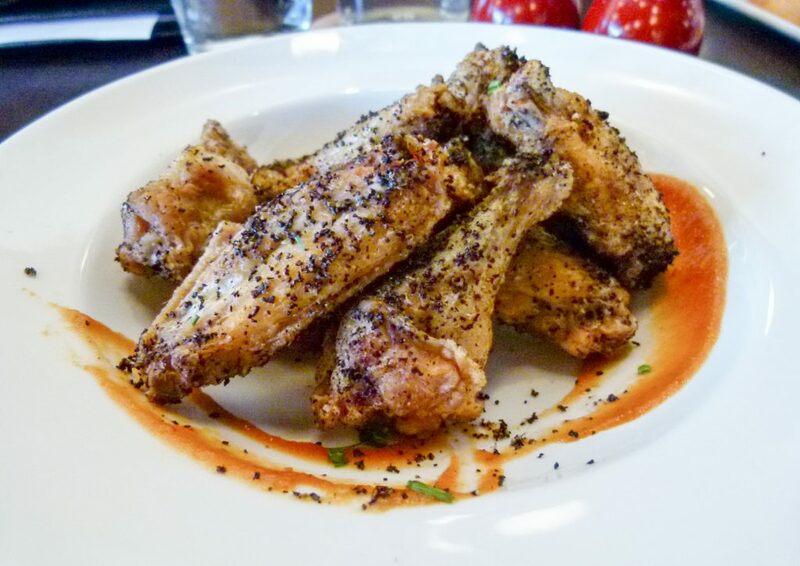 The wings were medium-sized, and there were about seven of them in an order. Served in a bowl and dusted with a dry spice rub, they had a little bit of a kick and were teamed up with smoked apple BBQ sauce that was spread on the inside rim of the bowl. The pairing provided a tasty flavor contrast. A little more of the apple BBQ sauce would have made it even better. 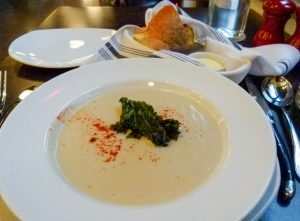 We forgot about the potato soup until it arrived with our entrees. It was just right, not too creamy, not too watery. 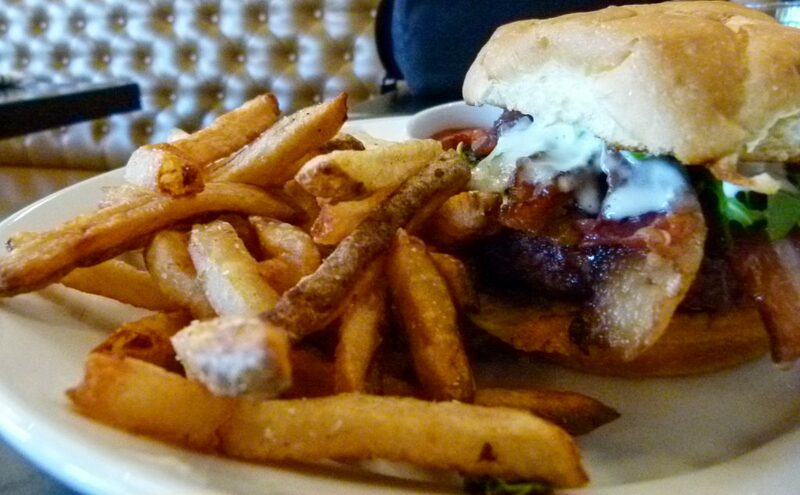 The Block Burger with bacon, blue cheese, and natural cut fries. I wanted to try Block 292’s blend of ground beef and ordered the Block Burger. I ordered it medium, so I could get some grill charring on the outside while the burger remained juicy inside. The burger was delicious, cooked just the way I wanted it, and built with bacon, arugula, onion jam, blue cheese, and tomato on a good bun. Natural cut fries accompanied it. 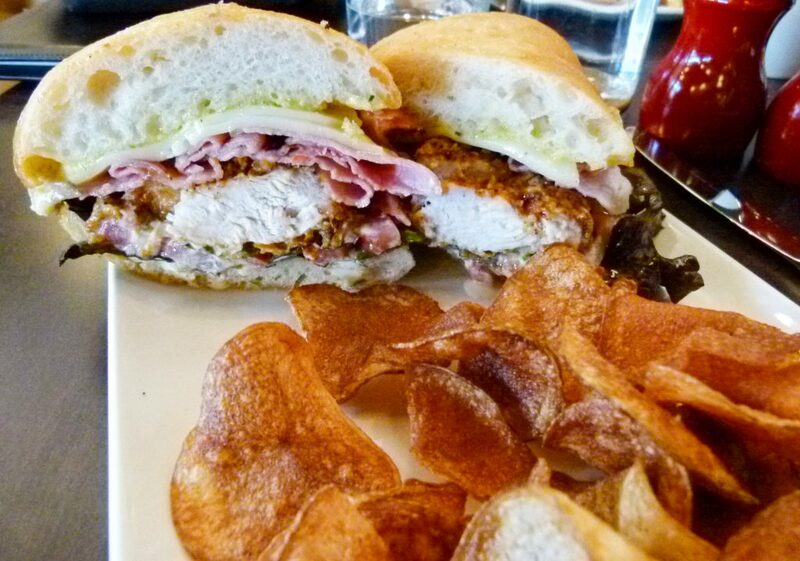 Sandwich of the Day: a fried chicken Monte Cristo sandwich with freshly made chips. M. had the sandwich of the day: a fried chicken breast Monte Cristo, and reported that it was delicious. 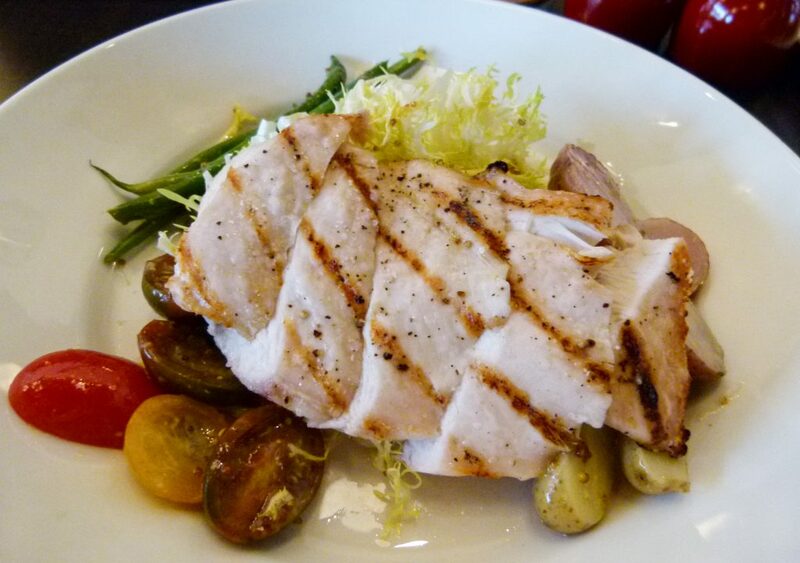 C. enjoyed the grilled chicken, a breast cut nicely into five pieces, served with frisee, fingerling potatoes, French beans, tomato, and a hard boiled egg. C. gifted me a piece of chicken to try. It was very tender and juicy with nice chargrilling on the outside. The service was friendly but more attention could have been paid to refilling the water carafe and our coffees. My next trip to Block 292 was about a week later for an early dinner. The decision on what to order was a little difficult with several enticing selections on the night’s menu. (Menus are served on a small wooden block. Get it? Block 292). Offerings included a pork chop, Jamison Farm lamb chops, roasted chicken leg, and two cuts of the day: a 16 oz. rib eye steak and a strip steak. The attentive server had already checked back once. The pressure was on. To get another taste of their locally raised and on-premises-butchered meats, I chose the rib eye. At dinner, a basket of hearty rustic bread and butter is served. For an appetizer, I ordered the cauliflower soup. It had just the right consistency and was served hot with good cauliflower flavor, a crispy cooked piece of kale on top, and sprinkled with a little top-notch paprika. Soup is an effective way to gauge a restaurant’s kitchen talent level. My soup tastings at lunch and dinner demonstrated that there’s definitely knowledgeable culinary talent at Block 292. Those sentiments continued through the rest of my dinner as well. The bone-in rib eye, ordered medium, was done just right: juicy on the inside and seared perfectly on the outside with the grill’s char marks crisscrossing the beef. The steak was very flavorful and tender with simple light seasonings and possibly cooked with a little grill butter. It was accompanied by broccoli raab, fingerling potatoes, spreads of red pepper-carrot puree, and green harissa sauce. The rib eye steak was the best I’ve had in recent memory. 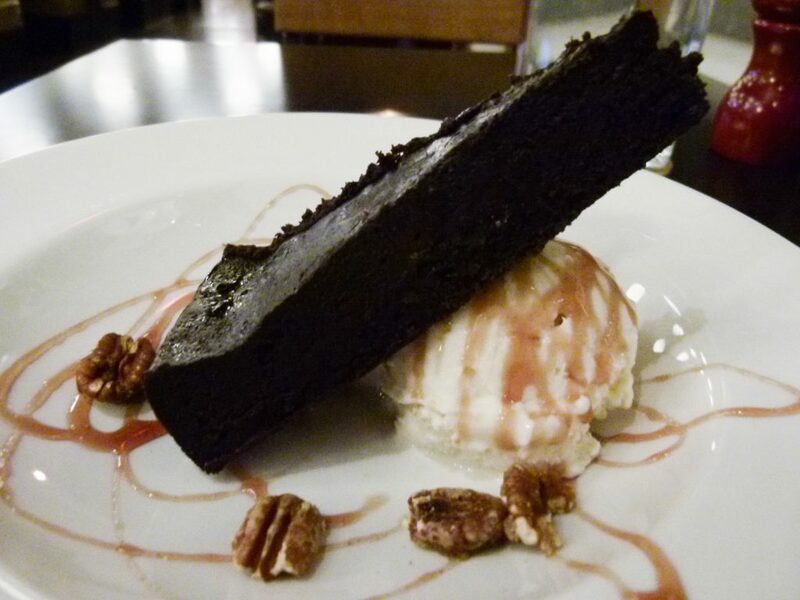 The flourless chocolate cake with vanilla ice cream, ready to rock your world. For dessert, I ordered the flourless chocolate cake served with juniper syrup, vanilla ice cream, mint, and candied walnuts. The cake was a deliciously dense chocolate delivery system. I mixed the ice cream, candied walnuts, and syrup to form my own decadent side dessert. I did save a little vanilla ice cream to pair with the cake. That was a delightful combination as well. Overall, the dinner service was impeccable. Not much of a meat eater? Fish, pasta, and vegetarian dishes are also on the menu. This is smart, so that any food veto can be overridden. You can have your steak, and your guest can have his or her preferred dish too. Block 292’s dinner menu runs the gamut price-wise. You can get some dinner entrees for as low as a $14 Block Burger and fries, or go whole hog (or cow) and get a cut of the day like I did and have the 16 oz. rib eye steak for $40. One could also enjoy a meal just from their small plate appetizers, which include mussels, roasted beets, mixed greens, soup, and charcuterie. Apps run from $6 to $15. Local sourcing continues at the bar with a rotating selection of Pittsburgh craft brews on tap, Wigle Whiskey, Boyd & Blair Vodka, and Maggie’s Farm Rum. There is a nice, tight selection of quality wines and liquors. Being part Irish, and enjoying a taste of its native waters occasionally, I was attracted to the bottles of Tullamore Dew and Jameson Irish Whiskey standing sentry on the back bar. Broadhurst said they also use them for Irish coffee. I spotted copper mugs for Moscow Mules hanging in the bar area, which is good because the drink is continuing in its revival. Other, more modern drinks and classics alike rotate through as featured drinks. For more temperate dining, the restaurant’s large garage doors can open, and there’s a patio out front bordering the street. Block 292 has just started an à la carte Saturday brunch service from 10 a.m – 2 p.m.
Block 292 is a promising new restaurant for Pittsburgh. It supports local farms and businesses by purchasing high-quality ingredients, which is a win-win for everyone. Through their culinary talents, they then combine these ingredients into very pleasing food. It will be interesting to watch Block 292’s growth and changing seasonal American menu. Tues.-Sat. 10 a.m. – 7 p.m.
Mon.-Fri. 11:30 a.m. – 3 p.m.
Tues.-Thu. 4:30 p.m. – 9 p.m.
Fri.-Sat. 4:30 p.m. – 10 p.m.
Sun. 10 a.m. – 3 p.m. 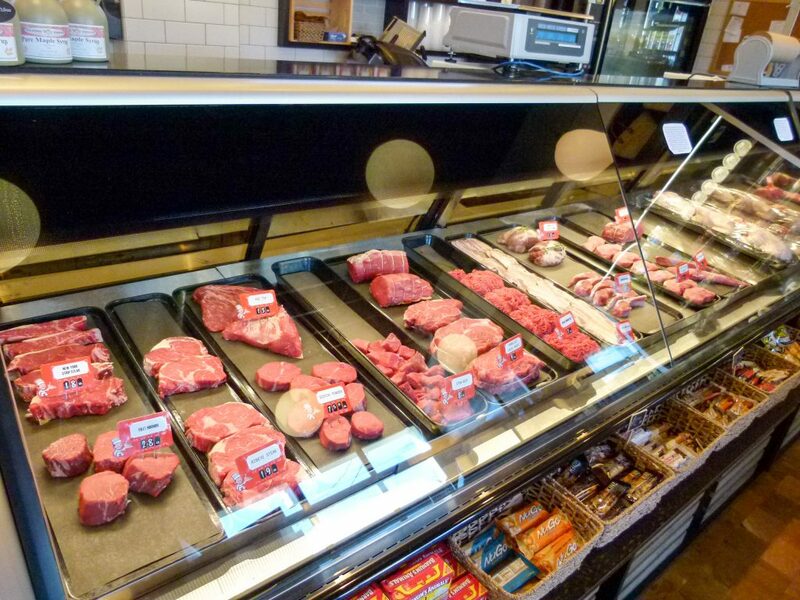 Locally grown and freshly butchered cuts of beef, pork, and chicken in the market.